Today, I’m preparing to be the keynote speaker tomorrow at the annual meeting for Kindred Connections, a Vermont-based organizations that connects cancer survivors with cancer patients for informal, friendly peer relationships. That’s a long way of saying that the organization helps people going through cancer treatment talk with someone who has cleared that hurdle, so to speak. I’ll be speaking to the group about my experiences with cancer treatment and exercise, as well as my book and some of my “take-home” points about exercise. Here’s one of my themes: Do Something Often: A Little Exercise Every Day, On Purpose, is Very Valuable. I often wonder if people think that exercise has to be very precisely programmed. I know that I wondered during chemotherapy if I had enough guidance about what to do or not to do. I was told by my physician to “do what you feel like doing”, with the caveat that he didn’t expect I would feel like doing very much after a while. I had been a competitive cross-country ski racer, before Cancer, and I was used to running half-marathons, training by running mountain trails, and ski racing 32-mile races in mountainous terrain. After surgery for ovarian cancer and in the midst of arduous chemotherapy, I threw my usual fitness routines and fitness goals out the window. I adjusted everything so that my activity served the purpose of recovering from cancer and building health. Fitness and competition could take a hike; I slowed down. But I didn’t stop. Instead of running, I walked. Instead of swimming far, I swam less far. I swam more slowly. When I was anemic, my walking including stopping and sitting on stonewalls to rest. I only water-skied a little. (Smiley face here. Yes, I water-skied a little–slalom (ie, one ski). It was a high-point and I chose to do it on the days when I had the best blood counts–and I had asked the MD for clearance to do it. My point is that I stayed active, but I didn’t try to keep training as if I wasn’t in the middle of chemo. I adjusted. And I tried to do something outdoors, moving, every day as much for pleasure and normalcy as for the health value. I never tried to exhaust myself. I would recommend this approach to anyone. 1) Do a little as often as daily if you can. 2) Adjust so that you are pursuing health not fitness. 3) Ask your MD or other medical professionals if you have questions about your choices. Let them know your overall exercise plans. 4) Don’t exhaust yourself. 5) Enjoy it! Get outdoors, hear the birds, feel the sunshine, and give yourself the permission to know that a little is often as meaningful to your healing as a lot! And, every once in a while, indulge in something special. I hiked up my favorite mountain mid-way through treatment. I took it very slowly. Very very slowly, but reaching the summit was so special. I wouldn’t have missed it for the world. Sometimes you have to feel like Cancer is not winning, you are, and that’s how I felt on the summit that day. I was winning! The memory kept me going when treatment got more difficult near the end. This is what I will tell people tomorrow: Make your exercise plans meaningful for you and you are very likely to aid your healing on many levels: the levels you can measure and the levels you can not. Exercise has immeasurable value to offer your health. Enjoy. This entry was posted in Uncategorized on March 28, 2014 by activeagstcancer. 50 copies of my book will soon be going home with cancer patients in Vermont thanks to a grant from the Vermont Community Foundation and the efforts of volunteers and others at the Franklin County Kindred Connections organization. Personally, I’m humbly very happy to know that the book will reach people free of charge when they may most find it useful to them. My book will be given to patients in “Care Bags”, described as “fifty handmade cloth bags filled with thoughtful and caring gifts will be given to newly diagnosed cancer survivors”. The gifts will be given through a collaboration of the Northwestern Medical Center, Crafty Ladies, and various Vermont businesses. Special thanks to Sherry R. for thinking of my book and contacting me. I haven’t written as much on this blog lately as other endeavors have had my attention, but the book keeps on selling on Amazon. There was also another recent article for which I was interviewed–I need to track that one down. Interestingly, I have been surprised, but it’s true, I have finally reached the part of survival that my doctor used to predict that I would: Where it all starts to seem like a long ago memory, no longer a part of life that overshadows everything else. I remember that I did not believe him that I would ever get back to “normal”. I didn’t admit that, but I was sure that I would always be as terrified as I was immediately after treatment ended. I think part of me thought that to remain vigilant against cancer, I would have to remain scared of it. Well, no. Life has resumed feeling… for lack of a better term somewhat “ordinary.” But I mean that in a good way. If you’re in the thick of it and you feel a weird disbelief when someone tells you you’ll get through it, it’s okay. I can promise you this: you’re on your own path and your own timeframe and you’ll adjust as you need to, when you need to. And… on the other hand: If you need help to find peace of mind, ask for help. You deserve it. And meanwhile, hope you’ll stay as active as you can and enjoy being alive. There’s a great opportunity in cancer survivorship to realize how much you love being alive. It’s cliche, I suppose, but it’s true–and it’s the only part of the whole experience I occasionally miss when normal tasks let me forget how special our time on earth really is. This entry was posted in active against cancer, cancer exercise program, cancer survivor, exercise and cancer on October 31, 2013 by activeagstcancer. The last twelve months of my six-year cancer survivorship have been a relief. I stopped having insomnia. At least most of the time, now, I can sleep most of the night. That is a huge relief. I stopped having to get checked up on at the oncologist’s office–at all–for twelve months. Which may, in fact, be why I started sleeping again. I stopped feeling exhausted and stressed out; I started exercising enough to lose the weight that the insomnia, exhaustion, anxiety and stress of post-chemo life had put on my frame. I started to feel like myself, more or less, again. I stopped thinking so much about cancer. I started to just be another middle-aged woman wishing she was a little younger looking than she is. I started to feel like athletic competition might be in my future again. I started to just let all the worries go. Of course, my book, being out there, has made it clear to the world that I’m a cancer survivor. And I’m always happy to chat with anyone about exercise and cancer recovery. But, unlike when I started writing the book, I think that there are more and more in the medical field who can help encourage cancer survivors to exercise. The trend is so clearly towards recognizing the benefits of exercise that I see the theme at cancer survivor events now. I think it’s nearly common knowledge, and that, friends, makes me very happy. The best reason to exercise is to try to help save your own life. The second best reason might be because it’s fun and meaningful and helps your daily quality of life go way up. Okay. I know. That was more than one reason. I love exercise. I love being able to move my body through space. I love sports skills, time moving in the woods outdoors or in the lake water. I love feeling like a kid. I love competing (sometimes) and I love having fun. This is just a rambling blog post to check in and say hello. I wish everyone much luck recovering their health. If you think that you might like to read about the many reasons exercise can help you fight cancer, or if you want some exercise ideas that aren’t confined to the gym, or you want some mind-body tips that can help you combine exercise with the power of the mind to help you heal, check out my book. You may want personalized advice from your medical team, of course, but sometimes it’s nice to read about how other cancer survivors handle their treatment and their exercise. Take a look, and drop me a note and tell me how you liked the book. This entry was posted in Uncategorized and tagged active against cancer, cancer recovery, exercise and cancer on April 10, 2013 by activeagstcancer. In my last blog, I promised to write about a specific technique that can help you reframe your exercise experience. Reframing is a borrowed term from psychology and it basically means shifting the context for the better. For example, saying, “I have an injured knee so I can’t run and that stinks!” That deflating way of looking at an injury can be reframed: “I have an injured knee, but I can walk and do strengthening exercises to further speed my recovery. I’m grateful that I can walk, even if I can’t run right now.” Yes, it’s a “glass half full” instead of “half emptry” approach, but oh, it does help you stay positive in the face of limitations. So, now for the specific technique, which I developed spontaneously in 1992. That fall, I lost a really good friend to a car accident, and I was stricken with deep grief. My friend Martin, however, had been such a wonderful person that I was pretty determined to do something positive with my grieving process. For me, I made the decision to start ski racing (cross-country) so that I would have a lot of fun and some goals to meet that winter. It was instinctual, really. I just thought it would help–and it certainly did. But my first goal was to get moving and get in better shape. Back injuries had kept me away from running for a while. I needed to start running, but I was pretty out of shape. I was doing okay, but I noticed that I called myself all sorts of negative things when I got breathless running. “Out of shape” is the only label I can share with you now. I just wasn’t being nice to myself. So, spontaneously, I stopped running and stood still, and said to myself, in my mind: I’m going to stand still until I start saying something nice to myself. I tried, “I’m getting in shape. I’m happy I can be here outdoors today. I’m lucky to be alive.” That sort of thing. I was pretty instantly cheered up. And I started to run again, slowly. I felt a little lighter. The positive thoughts continued, briefly, then I started crabbing at myself again. I stopped, stood still, and forced myself to think of something positive. “I’m getting stronger. I’m in great shape to get stronger. I like running.” I started off, running again, trying to keep a positive thought train in my head. Eventually, all this stopping and starting led me to want to run along with a mantra or simple repetitive thought in my head. I don’t know, twenty years later, what those first mantras were, but I can tell you, I was a different person after switching my mentality, during training, from a harsh inner critic to a soothing, encouraging voice. The sports psychology people call it “positive self-talk”. I don’t care what you call it, but if you are recovering from cancer and you are trying to do some exercise, I hope you will consider also training your mind to be kind to your body. You can applaud yourself for taking steps to be healthy. You can eliminate negative self-talk–by using my start/stop method or by using a positive mantra. Eventually, I ski raced, that year. My results were not impressive on paper, but at every start line I said a little prayer that I could race with a good attitude of joy and gratitude at being alive and healthy. That attitude saw me through my grief and other obstacles in life. I sometimes had race goals that were secret at the time, such as to be the the most joyful racer or to have no negative thoughts all throughout the race. In a long ski race, that might be four hours or so, so you have plenty of time to either encourage or discourage yourself. I knew which I liked better. To be honest, training with a positive attitude helped me not just go on to be a competent strong 50-km ski racer, or to run up mountains well, it helped me in my whole life. And it certainly helped me to thrive during cancer treatment. I’ll write more about my mantras during chemo in my next blog. My advice? Start where you are and be nice to yourself. Don’t just exercise your body. Exercise your mind in a positive way at the same time, and you might get more than double the positive effects. Have your exercise hour become an hour of joy, an hour of renewal, an hour of peace. It might just become the favorite part of your day. This entry was posted in active against cancer, cancer exercise program, cancer survivor, exercise and cancer, livestrong, Nancy Brennan, oncology rehab on October 19, 2012 by activeagstcancer. I needed to walk the dog on this blustery, cool autumn day, and to be honest, I hesitated. I was wishing it was warmer outdoors. I live in Vermont and when I say “cool” I mean above freezing but not much so. There is snow on the mountaintop a couple of miles away. It’s chilly and cloudy, and by some accounts, the weather is lousy. The autumn leaves were blowing around and the wind was noisy. Some bright yellow aspen leaves danced on their branches in a spot of sunshine. My mind cleared, my heart pumped, and I felt glad that I went out for the short walk. My dog, we should mention, is always glad to walk. What if we were more like our canine companions? What if we didn’t recognize “bad weather” as a deterrent? What if, instead of thinking of our exercise opportunities as “chores” or obligations, we relished them as time to be peaceful, joyful, or quiet the mind. Time to observe nature. Time to feel the sunshine or the rain. Time to stop rushing around in our cars, or surfing on the internet. We can find exercise to be time to heal. Left foot, right foot. Repeat. The truth is that you can reframe your exercise goals any way you want to. You don’t have to use words like “training” or “workout”. You don’t need to compete in races or have goals to get faster. You can exercise for an hour a day as a meditation, as a path to inner peace, or as a way to feel joyous despite the day’s stresses. I’ll write another post, next time, about a really specific way that I came up with years ago to help create a mood shift while you’re exercising. For now, I will leave you with this thought: Exercise is not mechanical if you look at it broadly enough. Exercise can also be rich with meaning and with purposes like helping yourself heal or be happy. When you faced a hard disease like cancer, you can use exercise as time to heal and reconnect with your body in a nurturing time. You can set aside your suffering and try to find pleasure in your physicality. So, reframe exercise to suit your true self. Set your own goals and make them count for you! This entry was posted in active against cancer, cancer exercise program, cancer survivor, exercise and cancer, livestrong, Nancy Brennan, oncology rehab on October 16, 2012 by activeagstcancer. I recently went to hear Shannon Miller, gold medal gymnast and now ovarian cancer survivor, speak at UVM where she was sponsored by Fletcher Allen and the Eleanor B. Daniels Fund. Shannon’s speech was uplifting because of her personal courage and optimism. She was genuine, open, and honest in talking about her experience coping with ovarian cancer, surgery, and treatment. Even though she saved her handstand for the next day on her visit with gymnasts, she radiated with her champion glow–something that her experience with cancer has not changed. My husband appreciated her practical advice and optimism, as he listened in the audience with me. It seemed that Shannon is fighting cancer with a champion’s attitude, and she appears to be winning, as her health is good right now, over a year after treatment ended. After the talk, though, a funny thing happened on the way back to my car. I was sad. I didn’t at first know why. I was just sad. In reflecting, I think there are two main reasons. First, I really hate cancer. All I can say is that I wish that Shannon had not had cancer. She is so young, vibrant, and has a young family. I know in my mind that cancer doesn’t pick its victims in any way that is fair, but honestly, it kind of breaks my heart that she has had to deal with ovarian cancer. Second, I am now five-year survivor of ovarian cancer. Her talk about diagnosis, the shock, the rigors of treatment, and the fears of recurrence brought back a lot of my worst memories of my own ordeal. I don’t dwell on them often in my day-to-day life any more. Hearing her account seemed to trigger some sadness in me. Tears came, then went. A passing grief. My own cancer survivorship, it seems, is still evolving. That was the first time in a long time I had felt such sorrow. Shannon mentioned something I thought was important: She said she believed that you need to allow yourself to have your feelings. I believe that, too. Sometimes cancer experiences are frightening, sorrowful, painful, or even maddening on some levels. You can’t just check a box that says: I will always be happy and upbeat in the face of my cancer ordeal. Not going to happen. The toil and troubles of cancer are too rigorous. Everyone will feel sad, hurt, scared or angry at some point. You wouldn’t be human if cancer didn’t upset you. But, like Shannon said, “When you fall, you get back up.” So, you can accept the so-called “negative” emotions as you feel them, but then you get on with your day. Maybe your day can include getting support or regaining your health by taking care of your body and of your emotions. Get counseling if you need an expert’s help. Let someone close to you know of your pains, physical and emotional, and then, respond by getting up, moving on, and having a core belief in your ability to cope, your odds of healing, and your inner strength. Everyone has inner strength, with or without gold medals in your past. This entry was posted in active against cancer, cancer exercise program, cancer survivor, exercise and cancer, Nancy Brennan, shannon miller healthy lifestyle on October 4, 2012 by activeagstcancer. 2- Racing phase. I took up Nordic ski racing with a great deal of commitment after my best friend at the time passed away suddenly. He was a superb athlete. I started to race because “a little voice in my head” told me it would help. I trained daily and I went from last place race finishes to finishing with admired peers in the citizen races in the 1990s to early 2000s. 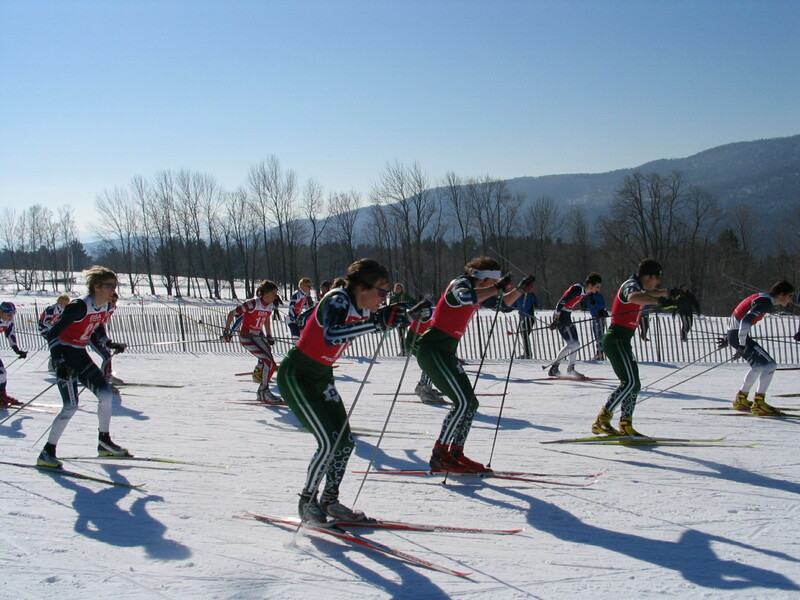 My favorite event was the 50-kim ski race. I loved loved loved marathon ski races. … And I threw in some running races, with quite a few half-marathons and some mountain road races like Mt. Washington. Generally the confidence, fitness and discipline gained from racing and year-round sensible training gave me a lot of joy. 3- The cancer phase. This included two years or so when I was trying to train and race as usual, but I had cancer that I didn’t know about. (Ovarian cancer is sneaky that way.) I felt lousy. Then I had life-saving surgery and chemo. Chemo, as you might know, though, can be a rough ride, and during 6 courses of carbo/Taxol, I had to make a lot of accommodations based on how I felt, anemia, etc. But I did have a lot of times during treatment where I could walk, hike, swim or water-ski. Just slower and less far than usual. It was still fun–especially compared to getting an infusion. I knew I benefited from that exercise and later did a ton of research and reading on why exercise helps cancer patients, which became the basis of my book. Anyone for a hike? Hair Optional. 4- Phase Four: Racing Again. Oh the power of goals. As a friend who is a stellar athlete shared with me once, “I have to have race dates on my calendar or I just won’t keep up with training well.” Well, that makes sense, now doesn’t it? So, this week I put a race on my calendar for about 9 weeks from now. I’m nowhere near ready, but I will be when it comes around. It’s 4.5 miles up a mountain, the tallest in Vermont. A running race. That sounds fun, now doesn’t it? It does to me. They say you can gain back 80% of your fitness in 6 weeks. Or something like that. Let’s hope so. No matter what the race results will be, I’m already energized and I feel like I have some of my pre-cancer athletic confidence back already. Oh, the power of a goal. I recommend you set one for yourself. There’s really nothing like it. Now, I have to go out and run. Yay. 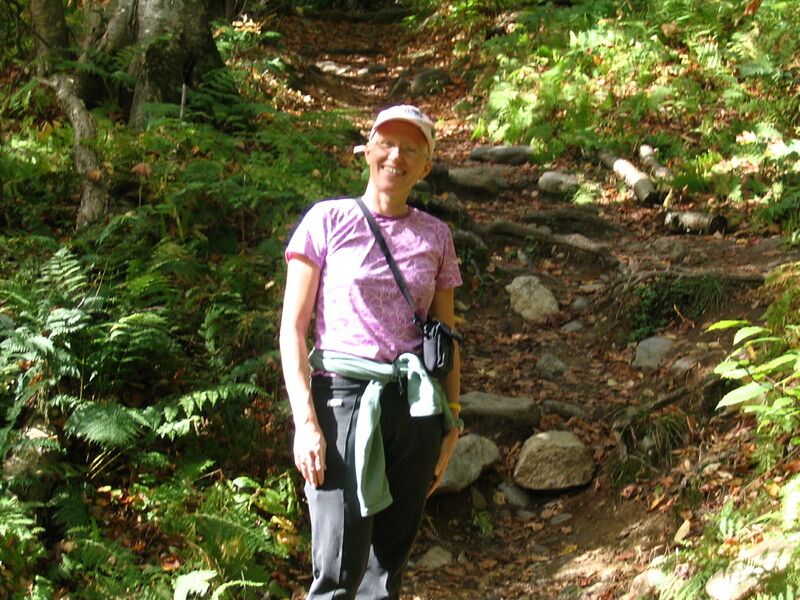 This entry was posted in active against cancer, cancer exercise program, cancer survivor, exercise and cancer, Nancy Brennan on June 23, 2012 by activeagstcancer.